For as long as I remember, the end of summer has been heralded by the yearly blackberrying trip with my family, setting off armed with various plastic containers and returning with a carload of blackberries and purple-stained hands. Of course in recent years, I haven't been living with my family, so I haven't always gone blackberry picking with them. Last year I went with my housemates and we picked about 3kg of berries - a very successful trip. This year's trip was not so successful. I left it rather late in the year and by the time I went out fruit-picking with my boyfriend, there were few blackberries to be had. We stripped those bushes we did find pretty bare, and still came back with less than 1kg. I was hoping to make jam with some of our haul, but realised I would have to use all the blackberries if I was going to make a full jar. Everyone knows that the only point of picking blackberries is to make blackberry and apple crumble, so I wasn't going to sacrifice my crumble for jam. Instead, I decided to make just half a jar and use it straight away in a recipe. The recipe I chose was a bakewell tart. The traditional bakewell tart is a long way from the one of my childhood, which was made by Mr Kipling, came in a foil case and consisted of a bitesized shortcrust tart covered in a thick layer of white icing, topped with a glacé cherry and a layer of raspberry jam in the middle. Fondly as I remember Mr Kipling's offerings, I decided to make a traditional bakewell tart - still a shortcrust tart with a layer of jam in the middle, but with a frangipane filling and topping of flaked almonds. I also used blackberry and apple jam instead of raspberry - because that was what I had and I read that in the past, people used whatever jam was in season. 1. Mix the flour and salt in a bowl and grate the butter into the bowl, keeping some of the wrapper around the butter to protect it from the heat from your hand, then mix again. 2. Rub the butter into the flour with your fingertips until it resembles breadcrumbs. 3. Mix the cold water into the crumble mixture little by little until it comes together into a ball when kneaded together. Wrap in clingfilm and refrigerate for at least an hour. Preheat the oven to 190C towards the end of this hour. 4. Make the filling in the meantime, beating together the butter and sugar. Add the eggs and flour at the same time and beat to combine - the flour will stop the mixture from curdling. Beat in the ground almonds and baking powder. 5. Roll out the pastry on a well-floured surface until the surface area is big enough to fill the tin, using an offcut of pastry to press the pastry into the corners. 6. Line the tin with baking paper and fill with baking beans, dried pulses or rice to weigh it down. Then bake for 15 minutes, removing the paper and whatever you used to weigh it down 2 minutes before the end of the baking time. 7. Spread the jam across the base of the pastry case, then spoon the frangipane on top and smooth it out with the back of a spoon. Bake for 25 minutes until well risen and golden, adding the flaked almonds on top after 20 minutes. 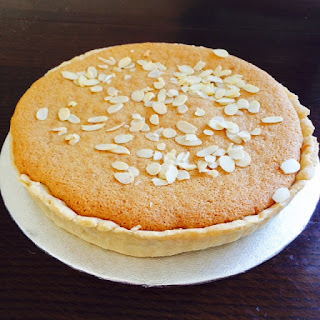 There you go - a bakewell tart filled with sweet jam and a soft, spongy frangipane.